Duplicate Sweeper is an intuitive duplicate file finder that allows you to clean up your hard drives by getting rid of duplicate files, using custom rules. Thanks to drag and drop support, you can quickly load folders into the app, although you can also use the tree view to manually navigate to their path. Before the scan is started you can choose to include the usual locations like documents, photos, contacts, desktop and favorites. 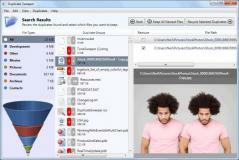 The results are shown in a dedicated window, where you can see groups of duplicate files and their paths, and extensions. You can choose to keep all newest files, send selected duplicates to the Recycle Bin, and open selected items in Explorer. Furthermore, you can save the search results to file, and set the program to ignore files that are over or under a user-defined size limit.